Hey guys!! Its Christmas time!! It is that time of the year when you join your dear ones to celebrate. A time of love, prayer and celebration. With your family and friends joining the party, apart from the meal and the centerpiece, it is also time you spend some time cleaning up your house. You won’t like to enjoy the eve amidst dirt, right? So here we help you to ease the Christmas cleaning process with some simple tips! The first thing is to finish doing the dirty work. Clean up your upholstery, entrance and your windows. Devote entirely on the cleaning, mopping, scrubbing and dusting out all dirt. Vacuum the upholsteries, and donot forget to clean the carpet just before the eve as your children would sit on the floor. Make space for the Christmas Tree on one side of the room. Pay extra attention while cleaning bathrooms, as it will be used more and a sparkling clean toilet creates a good impression. Use toilet cleaning products but test it in small area first. All furnitures pushed up against the walls is not a good idea for a cheerful conversation to take place. So keep in mind how you arrange your furniture. It boosts socialising by bringing people closer. Small points such as each chair getting access to coffee-table, small tools in case your guest wants to move around, anchoring the seating around an area rug will add to the whole set up. You can use dimmer as they are low-cost, and it brings coziness to the atmosphere. Put all your lights on dimmer as every one looks better in low light. You may add candles to bring some romance. Try not to use heavy perfumes. This section of your house needs extra attention. Arrange things in order so that everything is within reach at the time of Party. Clean your oven, your fridge, get your glassware and cutlery in sparkling condition. Don’t forget to clean the cabinetry, countertops and kitchen accessories. You may rinse the outside of the glass with vinegar to get that effect. Keep your checklist close at hand to change/add anything last moment. The party area needs to be kept spick and span. Polish up those spaces where the guests would be using most during party. 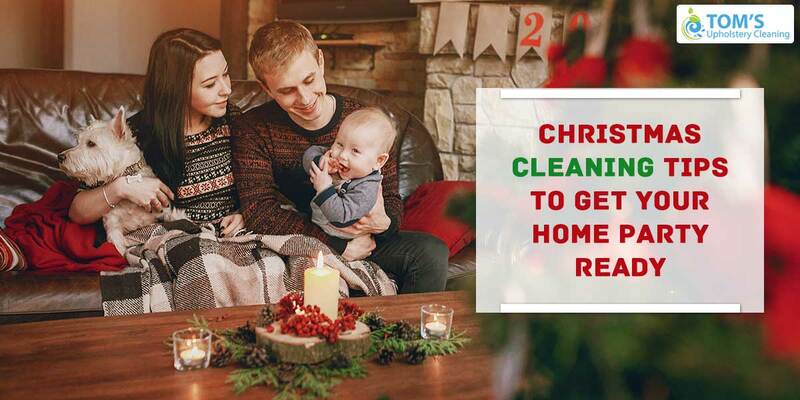 These are some Christmas cleaning tips you need to remember and if you are looking for a professional house cleaning company with their Christmas cleaning offers then Toms Upholstery Cleaning Melbourne always ready to help you.